View cart “Nature and Life: Survival, Religion and Art” has been added to your cart. This necklace refers to the origins of the world, ‘prehistory’ & the development of human culture. 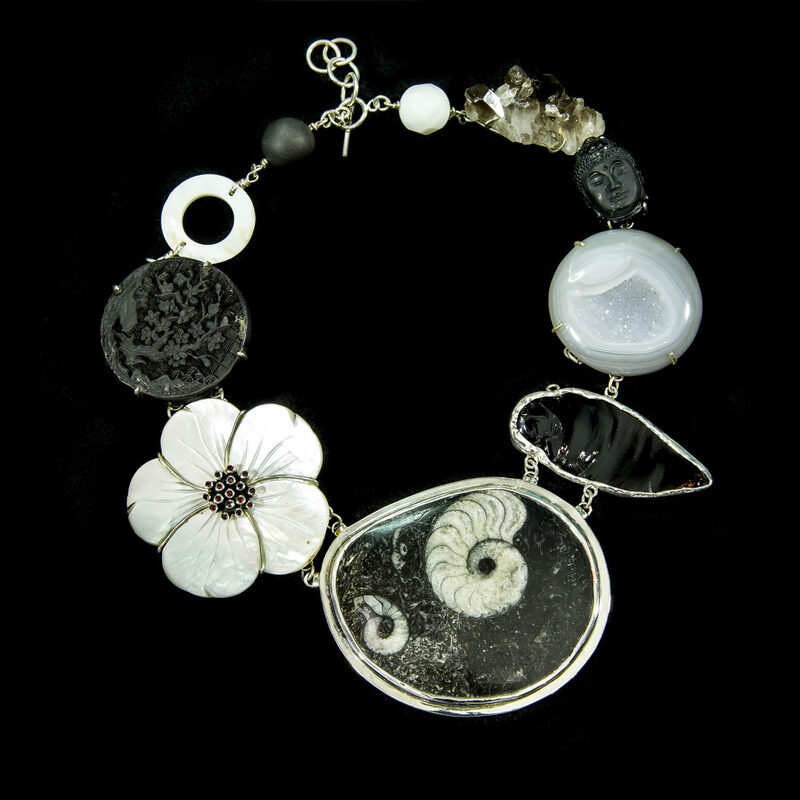 Earth’s pre-human origins, are symbolized by the beautiful black, grey and white ammonite fossil. The obsidian ‘arrow-head’ references human’s shamanistic hunting and ‘nature-based’ lifestyle. ‘Culture’ is represented by the use of carved mother-of-pearl flower & Chinese lacquer bead. ‘Religion’ – is represented by a carved Buddha’s head. There is a Postmodern appropriation of elements from disparate time zones and countries and binding them together in one piece. The ‘rawness’ of items references Jane’s New Guinea childhood (uncut crystals, fossil, ‘arrow-head’) where bone, feather and pearl shell were used as body decoration. Binding items together refers to ritual action combining fossils, carved pearl shell and numerous other stones)’. ‘Binding’ in S/Silver symbolizes ‘joining’ such as a wedding ceremony. This necklace refers to the origins of the world, the development of humans and their cultures. 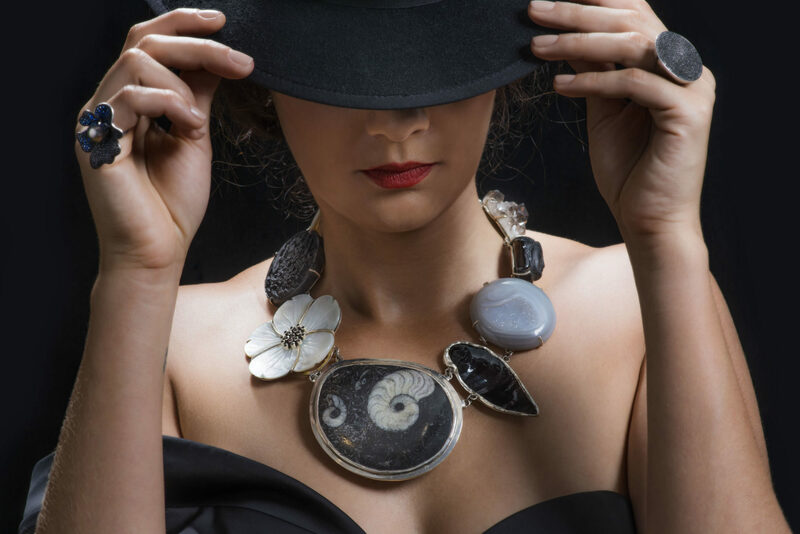 In this necklace the notion of ‘prehistory’ is symbolized by the beautiful, black, grey and white ammonite that lived in the pre-historic oceans all around the world, and for me, references the period before human life. Here, the historic era is represented by the cultural carving of mother-of-pearl flower, the carved black onyx Buddha’s face and Chinese lacquer bead. I also see these pieces as Post Modern in that I am appropriating elements from disparate time zones and countries and binding them together in one piece. In the rawness of the piece I refer back to my Papua New Guinea childhood (referenced by uncut quartz crystals, chipped ‘arrow-head’ and mother-of-pearl flower set with garnets) where organic elements such as bone, feather and pearl shell were used as body decoration in a fashion that was ‘raw’ to Western eyes. In Papua and New Guinea, pearl shell was also used as currency. The possibly very old (prehistoric?) obsidian ‘arrow-head’ references human’s survival via hunting and defence, and the shamanistic ‘nature-based’ religions that were a precedent to today’s mainstream religions. The carved black stone Buddha head represents one of many world religions, establishing the development from a shamanistic hunting culture to more stabilized communities with a developed religion (such as Buddhism). The binding of the necklaces together refers to ‘binding’ as ritual action (combining unrelated parts together, such as fossils, carved pearl shell and numerous other stones)’. The interesting thing here – is that the notion of ‘ritual binding’ has come down to us from pre-historic shamanistic cultures, to present religions (and lasted for possibly 60,000 years.) Binding symbolizes ‘joining’ and in certain religions today the hands of the wedding couple are wrapped in silk cloth (or bindings).